Chancellor, Vice-Chancellor, honoured guests and graduands, it gives me great pleasure to be presenting today the Right Honourable Dame Margaret Beckett Member of Parliament, for the award of Honorary Doctor of the University. Since 1983, Margaret has been the Member of Parliament for Derby South and has worked at the forefront of national politics. She is the longest-serving female MP in the history of Parliament and sits on the Labour Party’s National Executive Committee. Margaret has just been re-elected as Chair of the Joint Committee which scrutinises National Security Strategy. Before entering the political arena, Margaret undertook an engineering apprenticeship in metallurgy and worked as an experimental officer in University of Manchester’s metallurgy department. She later changed materials and became a Labour Party researcher, and worked for a time as a researcher at Granada Television prior to being elected as MP for Derby South. She was first elected to Parliament in 1974, representing the constituency of Lincoln, and held junior positions in the governments of Harold Wilson and James Callaghan. She lost her seat in 1979 but returned to the House of Commons in 1983 to represent Derby South. She became the first woman to hold the position of Deputy Leader of the Labour Party in 1992. Then in 1994, standing in after the premature death of John Smith, she become the first woman to lead the Party until Tony Blair took the role later that year. After Labour’s victory in the 1997 general election, Margaret became a member of Tony Blair’s Cabinet where she held a number of prominent positions. Initially the President of the Board of Trade, she was later the Leader of the House of Commons and Secretary of State for Environment, Food and Rural Affairs. In 2006, Margaret was appointed British Foreign Secretary, becoming the first woman to hold the post, and only the second woman to hold one of the Great Offices of State. Margaret was awarded Dame Commander of the Order of the British Empire in the 2013 Queen’s New Year Honours List in recognition of her public and political service. We have been fortunate to welcome Dame Margaret to the University on a number of previous occasions. In 2006 she officially opened the new £1.5m Clinical Skills Suite at our Kedleston Road site, which has since seen hundreds of nursing, radiography, counselling, psychotherapy and occupational therapy students pass through its doors. She joined us the following year to unveil a bronze bust of herself which formed part of the series ‘Women Who Have Made A Difference’ by sculptress Shenda Amery. The bust stands proud in the reception area of our Clinical Skills Suite as an inspiration to our students and staff. Margaret also visited the University in March 2016, joining a panel of leading politicians and business leaders from the region for a lively public debate on Britain’s membership, or not, of the European Union. 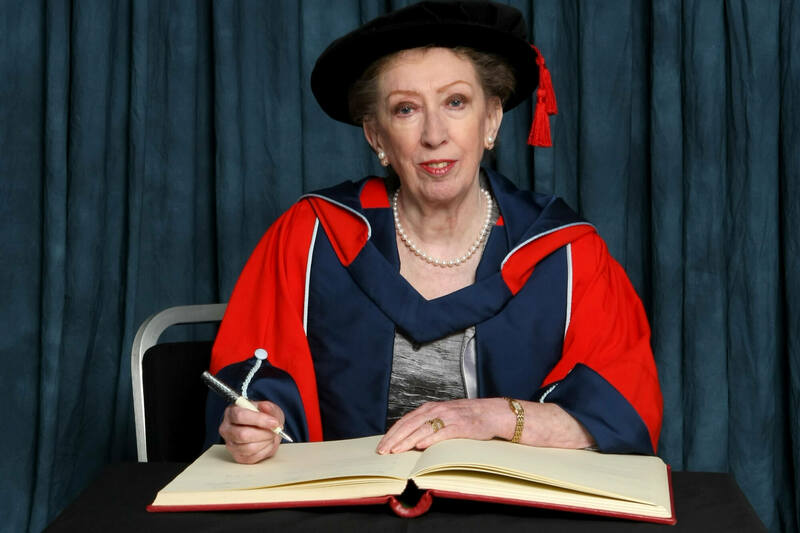 Chancellor, in recognition of her outstanding commitment and achievements in public service, both regionally and on the national political arena, we are delighted to award Dame Margaret Beckett the honorary degree of Doctor of the University.